Finish treatments for pressure-treated, cedar, ipe, mahogany, composite decking & more. A deck looks beautiful when it’s installed. But New England storms and temperature extremes have a definite weathering effect on decks old and new. To keep looking beautiful, your deck needs regular treatment with a top-quality finish. Professional deck refinishing by CT Painters provides several important benefits. A top-quality finish will limit water penetration on a wood deck, helping the wood to resist cracking, cupping and warping. Tiny metallic particles in some deck finishes (called UV blockers) protect wood fibers from sun damage, just like sunscreen protects the skin from sunburn. 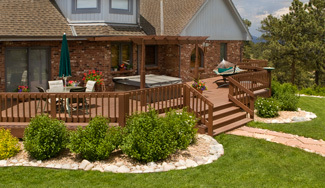 Pigments in deck finishes restore a uniform color to your deck. Deck Stain or Paint? We Help you Choose the Right Option! CT Painters has access to the best and most advanced deck finishes available. Deck stains (semi-transparent stains, translucent stains & solid color stains) are designed to penetrate into the wood surface, allowing the wood grain to show through the finish. Deck paints are designed to go over the wood surface. Our installation crews are familiar with all types of deck finish, including new thick-bodied paints that can bridge gaps and fill cracks found in older wood decks. We are Southern CT and Fairfield County's trusted interior and exterior painting contractor, serving Fairfield, Milford, Stratford, Greenwich and nearby for more than 30 years. In addition to painting or staining your deck, we can also paint and power wash the outside of your home, or add a fresh coat of paint to your living room or kitchen. Whatever painting services you need, we're the experts to call! Paint or stain. The right finish makes all the difference for your deck. CT Painters is ready to serve all your deck finishing needs. All our deck refinishing services are also available for deck railings, stairways, pool surrounds, deck posts and other exposed deck framing. We know you’ll be 100% satisfied because our skilled crew members insist on doing the best job possible. Selecting the right finish. Consulting with the homeowners, we select the most appropriate deck finish based on budget, desired appearance and deck condition. Preparing the wood surface. If necessary, we thoroughly clean the deck to remove mold, mildew and stains from decking. Applying the finish. Expert finish application ensures complete coverage and excellent appearance. Contact us today to schedule a Free Estimate for deck refinishing, whether it's deck staining, painting or any of our other interior and exterior solutions. Our professional paint services are available in Milford, Stratford, Greenwich, Fairfield, Westport, Ridgefield, New Canaan, Trumbull and nearby.